At our co-op meetup last week, once we’d got business out of the way for the day, we decided to play some games. Bryan‘s got a projector in his living room which he can hook up to his laptop, and he invited us all to create a Kahoot! quiz. We then played each others’ quizzes, which was fun. Back at home, I’d already introduced my two children to AirConsole, which they use to play games using their tablets as controllers. I searched for games we could play on the big screen without having to download anything and the first one we played was called Multeor. 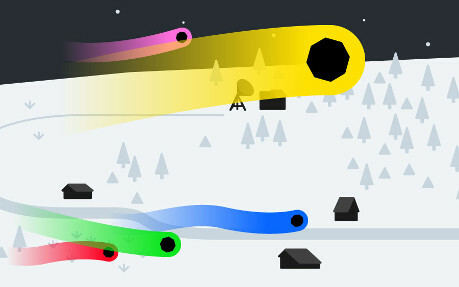 This involves each player controlling a ‘meteor’ which destroys things to collect points. A list I found on Reddit was also useful, although some of them are games that have to be purchased via the Steam marketplace. We played Spaceteam which, appropriately enough for our meetup describes itself as “a cooperative shouting game for phones and tablets”. It didn’t require the project, and was great fun. I even played it with my wife when I got home! While I’m on the subject of games, Laura introduced me to Paddle Force, which our former Mozilla colleagues Bobby Richter and Luke Pacholski created. It’s like Pong on steroids, and my children love it! Luke’s also created Pixel Drift, which reminds me a lot of playing Super Off Road at the arcades as a kid!